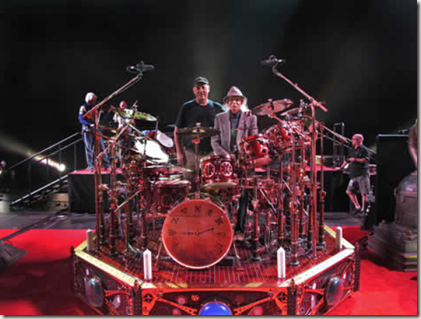 Update from Neil Peart: November 2012 - "Witness to the Fall"
In this update, Neil writes about seeing his first drum teacher, Don George, whom he hadn't seen in 45 years! In recent years Don and I had been in touch by mail and email, and he sent me videos of his current teaching ideas and methods. I was pleased to see that he was obviously still a gifted and dedicated teacher. For his part, when talking about this long-ago student, Don was once quoted, "Neil didn't have another teacher for thirty years, so I must have done something right." And he did -- Don gave me a strong enough direction toward what I needed to know that I could follow it through those decades. Most of all, he gave me the encouragement that I could be a drummer, if I worked at it. Essentially, Don kept me climbing that mountain for three decades, until I needed Freddie Gruber and Peter Erskine to guide me to higher elevations.